Earlier this month, Florian Irminger joined Penal Reform International as its new Executive Director. 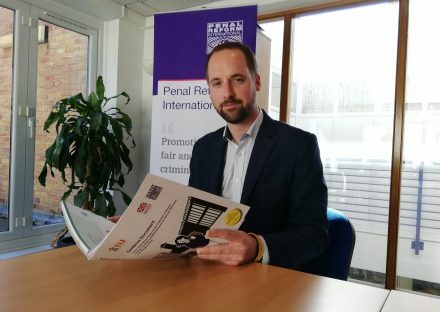 In his first blog for PRI, Florian reflects upon the organisation’s practical approach to penal reform, which has enabled PRI to play a key role in implementing international standards and provide effective and tailored solutions to criminal justice problems worldwide. It has been three years since the United Nations adopted the Nelson Mandela Rules. Since then, PRI has engaged with governments, law enforcement officials, prison staff and civil society to ensure that these revised minimum standards for the treatment of prisoners do not remain solely words on a UN document. We have worked to make the Rules practical, thanks to cooperation with the OSCE Office for Democratic Institutions and Human Rights (ODIHR). We have also made them accessible, with a two-minute animation and a Short Guide summarising the 122 Rules, which has been translated into nine languages. The team I have joined following my appointment as PRI’s new Executive Director is right to be proud of its work leading to the adoption of the Nelson Mandela Rules. PRI is widely recognised as one of the essential forces in the revision process. Through my work in my former role as Head of Advocacy at Human Rights House Foundation, I understand the energy and enthusiasm needed to drive such negotiations at the United Nations. PRI’s practical approach to standards is what has made it strong in such international negotiations. Our practical approach is the product of PRI’s willingness to engage with governments and state officials at all levels, in order to concretely implement such standards. We understand the complexity of state policies on detention. Rights of offenders and prisoners are not usually a top priority of politicians. Hence our core work with prison staff and criminal justice actors – and not limiting ourselves to political decisionmakers. As one of PRI’s founders, Ahmed Othmani, put it in Sortir de la prison (2002), our allies are sometimes not the ones we expect: the need for penal reform does not necessarily come from the politicians, but from the prison system itself, as those working in prisons face the dramatic gap between the needs and the means available. Building such alliances is what has made PRI so effective over the years. For example, in Yemen – which surely is one of the most difficult contexts in which we work –Guidelines on Health Services in prison (adopted by the country’s Corrections and Rehabilitation Department) have now been updated to reflect the Mandela Rules. PRI recognises that, for a significant proportion of people in prison, alternatives to imprisonment are much more effective. Between 2015 and 2017, PRI set up a fully functioning pilot system of alternatives in the governorate of Sousse in Tunisia. There were initially only eight places in Sousse that provided community services. PRI gave small grants to a variety of organisations that offer community service placements – including municipalities, local NGOs and railways – which saw the number of places that offer these services increase to 90. PRI also developed gender-sensitive and child-friendly procedural guidelines and training manuals, and facilitated workshops for judges, probation offices and institutions that provide community service placements. As a result of the project, the number of community service orders increased – to 532 in 2017 – and almost £200,000 was saved from the country’s prison department budget. Based upon the success of the Sousse pilot, Tunisia’s Ministry of Justice decided to replicate the experience in six new governates, with the aim of creating a national probation service. We are now looking to take this model to Morocco. Corruption is rife throughout the criminal justice process in many countries and has serious implications both for the human rights of detainees and the efficient administration of justice. Last year, PRI launched an anti-corruption project in Kazakhstan, helping to develop government accountability and good governance in the country’s law enforcement system. The project includes identifying internal and external corruption risk factors in prisons, building the capacity of both agency staff and law enforcement bodies to combat corruption, developing expert documents on identifying factors that require legislative changes, and increasing interaction between the government and civil society. PRI and Kazakhstan’s State Agency on Anti-Corruption and Civil Service jointly developed a design for an anti-corruption call centre, which the UK’s NSPCC Helpline service provided staff training for. We work on the whole cycle of the justice chain: from the international level to national policymakers, practitioners and beneficiaries, and supporting the rehabilitation of those who have left prison or finished a community-based sentence. A further example of PRI’s involvement in the implementation of international standards – this time, the UN Bangkok Rules on the Treatment of Women Prisoners and Non-custodial Measures for Women Offenders – is our work in Georgia, where PRI has been working on rehabilitation and re-integration for women offenders. We also focus our attention on increasing accessibility of support services for vulnerable children affected by their mothers’ imprisonment or conviction. Today, more than 700,000 women and girls are held in prisons around the world. Women offenders are disproportionately more likely to have been victims of domestic or sexual abuse. Throughout the criminal justice process, they are at risk of further abuse, violence and humiliation – from police, prison officers and fellow prisoners. Our work on concretely implementing the Bangkok Rules to protect women offenders is therefore essential. These few projects illustrate PRI’s approach well. We encourage states to engage with us on a wide range of themes. We aim at building engagement from all stakeholders involved in a country’s criminal justice system. We work on the whole cycle of the justice chain: from the international level to national policymakers, practitioners and beneficiaries, and supporting the rehabilitation of those who have left prison or finished a community-based sentence. Our strong regional presence makes it possible for us to change mentalities and make our impact sustainable. Since its inception, PRI’s strategy has involved supporting the establishment of local staff. Ahmed Othmani explains this strategy as a unique way of being able to change not only legislation and its implementation, but also mentalities and cultures. Our established presence in Central Asia, South Caucasus and the Middle East and North Africa, as well as Sub-Saharan Africa, is a remarkable force of engagement in many countries. We aim at long-term impact – or, as Ahmed Othmani put it: ‘We do not come to a country for a mission or a consultation and leave thereafter, we work in the long term to help create the conditions for change.’ PRI’s history is however not limited to the countries it works in today – neither is its future. As of today, PRI has worked in over 130 countries. We have always been able to build alliances with reliable and skilled civil society partners. Our work in any country would be impossible without national partners, who must be given the space to scrutinise and criticise the state, and to engage in public campaigning to change policies they believe lead to violations of rights of people in detention, including vulnerable groups. The number of people in prison, whether on remand or serving sentences, has increased in most countries over the last 20 years. Since a United Nations report on life imprisonment 20 years ago however, there has been no international assessment of the use of and issues surrounding life imprisonment, despite the fact that, between 2000 and 2014, the number of individuals sentenced to life increased by 84 per cent. Earlier this year, PRI and the University of Nottingham produced a briefing that assesses the use of life imprisonment as a global phenomenon. We will also be organising a civil society strategy forum on life imprisonment in December this year, which will be used to raise awareness and which will kickstart a global coalition to challenge the increasing use of life imprisonment. Engagement that builds a set of positive examples and practically shows the inhumane aspect of life imprisonment – described as ‘another form of a death sentence’ – will be key to PRI’s work in the future. Over the next few years, we also want to continue to support countries in reducing their prison populations and increasing the use of alternative sanctions. PRI continues to be a key player in the campaign for the abolition of the death penalty. For the World Day Against the Death Penalty next month, PRI will co-publish a factsheet on women on death row, based upon an upcoming report by the Cornell Center on the Death Penalty Worldwide. Over the next few years, we also want to continue to support countries in reducing their prison populations and increasing the use of alternative sanctions. This will include a new project, in partnership with the Thailand Institute of Justice, on rehabilitation and reintegration practices around the world for women prisoners, with a view to collating and promoting best practices that implement the Bangkok Rules. Alternatives to imprisonment have been at the heart of PRI’s work from the start and remain as such. With today’s financial pressure on state budgets and austerity in many countries, we have a strong, practical argument in favour of such alternatives: they are cheaper than building prisons and more effective. I am joining PRI at a moment when states should be looking into their first steps in implementing the Sustainable Development Goals (SDGs). Any country serious in its efforts to implement the 17 goals agreed on by the United Nations must look at its criminal system. Gender equality is one of those goals. Zero hunger is another on the UN’s agenda for 2030 – insufficient and unhygienic food in detention, however, remains a reality. And, of course, fulfilling Goal 16 on peace and access to justice for all requires criminal justice systems to be fair and effective. Prisons, by their very nature, are closed institutions hidden from public view, and therefore require particular attention with regard to external scrutiny, transparency and good governance. In many countries, criminal justice systems are unfair and discriminatory. Instead of protecting society from crime and safeguarding the rights of those accused or convicted, they can cause, drive and deepen poverty and hinder social and economic progress. We believe that fairer criminal justice goes hand-in-hand with more social cohesion, because the treatment of those at the hands of law enforcement is at the heart of all policies of any state. In fact, the treatment of those confronted with the criminal system is a good indicator of the overall respect for human rights in any country. This is what makes PRI as needed as ever, particularly in a context of ‘a global backlash against human rights’ – as Andrew Gilmour, United Nations Assistant Secretary-General for Human Rights, recently described it. Welcome to Florian and I wish him the very best of success. I also make the wow to have this so interesting Penal Reform letter in French. Involved in jails as weel, it is difficult to share your letter with colleagues and operational staff. Hi Florian, Greetings and congratulations. PRI will do well with someone as experienced as you in UN matters. So we must hope that the UN will matter a bit longer!. Let me start by congratulating you on this mammoth task you have braved yourself for. I have no doubt that yu are up to the task.Sadly we have been deserted by PRI for more than three years now when we really need to engage with your distinguished institution given the challenges and advancements in the Correctional services in this Southern part of Africa. It would be mutually beneficial to have this relationship revived and embraced with vigor. Congratulations once more. Thank you Desmond for your positive words about PRI. PRI always engages where it can and where we see opportunities for positive change. We are also looking at increasing our activities in various regions. Thanks again for your comment. In September 2018, Florian joined PRI as its Executive Director. He was previously the Head of Advocacy at Human Rights House Foundation (HRHF) in Geneva. Before joining HRHF, Florian co-founded ‘Stop Suicide’, a non-governmental organisation dedicated to the prevention of suicide among young people in Switzerland. Florian has been Chair of the Board of the House of NGOs in Geneva for four years. From 2009 to 2012, he was a member of the editorial team responsible for revising Geneva’s constitution, adopted in 2012, and was also a member of the young leaders’ programme of the World Economic Forum. Produced by ODIHR and PRI, this practical tool provides guidance for implementing the UN revised Standard Minimum Rules for the Treatment of Prisoners (the Nelson Mandela Rules).